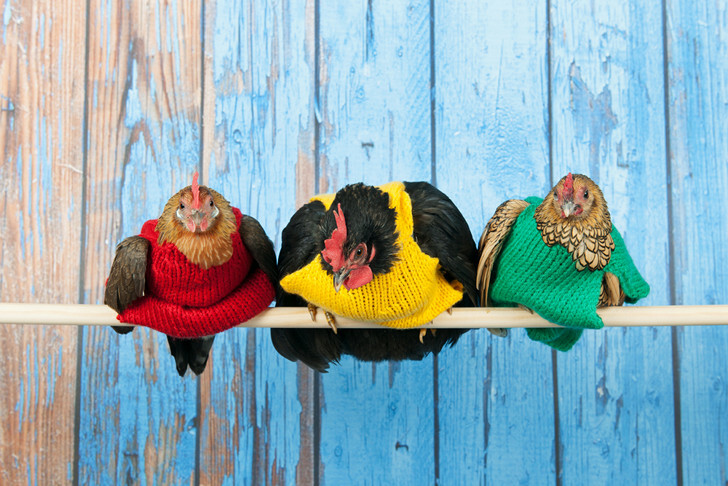 Why, exactly, are chickens wearing sweaters? We’ve knit mittens for koalas and put shoes on our dogs, but the question remains, what about the chickens? Do our feathered flocks really need new frocks? The Internet is surprisingly chock full of patterns to help us knit sweaters for chickens, but is it really necessary? Mother Nature Network has investigated, and the answer appears to be a resounding ‘probably not’. There are a couple of prominent schools of thought as to when and why it might be appropriate to introduce sartorial style into your chicken’s life. The first is in the horrific case of chickens who have been rescued from battery farms. Chickens who are subjected to the stresses of living in densely packed cages quite often pluck their feathers out. (Some battery farms engage in the equally horrific practice of “debeaking” their chickens to prevent this). 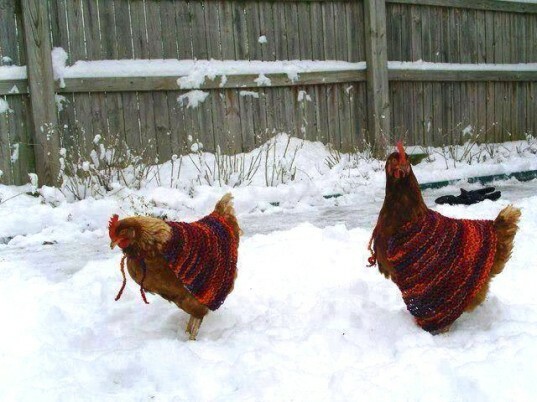 But it’s not just rescue chickens who are wearing sweaters; it’s become something of a trend in backyard coops: a cursory Google search will show you just how prevalent chicken sweaters have become. And, admittedly, it’s pretty cute. But some have cautioned that it might not exactly be in your chicken’s best interests to start engaging in dress up. The Chicken Chick makes no bones about it: “While it’s fine to engage in a little silliness with our chickens from time-to-time, sweaters are not only unnecessary, they can be dangerous.” Among the issues, the site explains that sweaters mess with chickens’ natural ability to moderate their body temperature. When it’s cold, chickens eat more to keep warm, and with a healthy coat of feathers, they’re a veritable furnace. Not only this, but sweaters prevent chickens from preening properly, irritate new feather growth, make them vulnerable to prey (not being able to move wings slows them down a bit), trap moisture next to the skin leading to mite and lice issues and, if that wasn’t alarming enough, chicken sweaters can lead to “mating accidents.” That’s right, chickens sweaters can be exactly the wrong type of protection for one’s chicken. The key lesson here is not to mistake your comfort with your chickens‘ comfort. Let them do what comes naturally—and if they’re losing their feathers in such a way to interfere with their natural capacity to stay warm, bring them inside for a bit. A moment’s dress up won’t hurt, but unless you’re an veterinary specialist, you likely want to let the chicken attire itself as nature intended. You NEED to research this more! This article is incorrect on most accounts. If you have a rooster the act of breeding often injures the hens, resulting in feather loss on the back. Farmers, those who CARE about their chickens have often resorted to "chicken Aprons" to protect their backs. Beyond that hens will mount other hens occasionally even if you don't have a rooster and then there's the whole "pecking order" thing. There's a reason why its called "PECKING" order. Before I even had a rooster and with plenty of space and loving kindness from us some of the lower ranking hens were denuded of feathers low on their back. In the winter that means you keep those birds in or you make them a coat. If your chickens need to fly to keep them out of the mouths of predators, then honestly they are going to be eaten by predators. Most chickens are poor flyers and they will not be able to elude a hungry coyote and they don't stand any chance at all with a hawk unless they stay within 5 feet of it or you have lots of shrubs! Allowing chickens to free range frankly is certain death in the U.S. There are way too many predators. Its best to put the coop in a spacious outdoor cage for them that is predator proof. Chicken aprons DO NOT limit them from flapping their wings anyway. Even those lovely fashionable capes wouldn't do it. And chickens hmmm... just like humans can very well adjust to having a coat for a while Honestly sweetheart visit a farm or search out more sources! You definitely need to investigate more! I would definitely put aprons on my chickens especially the younger smaller hens that are being picked on. My observation is that those hens that were getting picked on, tend to relax more wearing an apron. Perhaps they figure out that the other girls can't hurt them as easily! We've knit mittens for koalas and put shoes on our dogs, but the question remains, what about the chickens? Do our feathered flocks really need new frocks? The Internet is surprisingly chock full of patterns to help us knit sweaters for chickens, but is it really necessary? Mother Nature Network has investigated, and the answer appears to be a resounding 'probably not'.